In 1914 Sir Ernest Shackleton, one of the giants of Antarctic exploration, mounted an expedition to cross the frozen continent from sea to sea. 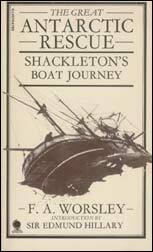 But before the crossing could take place, tragedy struck: the Endurance, Shackleton's ship, was held and slowly crushed in the jaws of a huge ice-pack, leaving her crew marooned hundreds of miles from civilization. This is the story of the many months they spent in the shadow of death on the shifting floes and islands of the polar sea, and of how they were finally rescued. The author, who was captain of the Endurance, lived through every mind-tearing minute if those terrible months. As a vivid, true-life story of adventure, heroism and suffering, it has no equal in the annals of exploration.